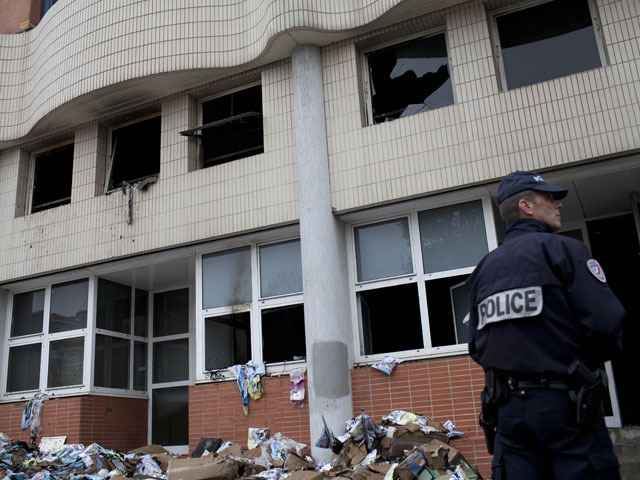 PARIS - French politicians and Muslim leaders denounced an arson attack early Wednesday that destroyed the offices of a satirical French newspaper after it "invited" the Prophet Muhammad as its guest editor this week. No one was injured in the fire that started around 1 a.m. in the offices of Charlie Hebdo weekly in eastern Paris, hours before the current issue hit the newsstands. The newspaper director, who goes by the name Charb, said the a Molotov cocktail was the cause of the fire. He blamed "radical stupid people who don't know what Islam is," for the apparent attack. "I think that they are themselves unbelievers ... idiots who betray their own religion," Charb said in an interview with Associated Press Television News. The front-page of the weekly, subtitled "Sharia Hebdo," a reference to Islamic law, showed a cartoon-like man with a turban, white robe and beard smiling broadly and saying, in an accompanying bubble, "100 lashes if you don't die laughing." Previous depictions of the prophet have caused major disturbances in Muslim countries. Islamic law generally opposes any depiction of the prophet, even favorable, for fear it could lead to idolatry. Ever since a Danish newspaper Jyllands-Posten published a dozen newspaper cartoons of the Prophet Muhammad in 2005, authorities there say they have foiled a series of terror plots against Jyllands-Posten and cartoonist Kurt Westergaard, who drew one of the most controversial caricatures depicting Muhammad wearing a turban shaped like a bomb with a lit fuse. Charlie Hebdo had also reproduced the cartoons, that led to a complaint by Muslim associations. The weekly was acquitted in 2008 by a Paris appeals court of "publicly abusing a group of people because of their religion." France's Prime Minister Francois Fillon called on officials to move quickly to find those responsible and bring them to justice. "Freedom of expression is an inalienable value of our democracy .... No cause can justify a violent action," Fillon said in a statement. A handful of ministers echoed similar indignation. Leading Muslim figures in France, a country that has western Europe's largest Muslim population, estimated at 5 million, also condemned the attack. The president of an umbrella group representing France's Muslims also condemned the apparent attack, as did the rector of the Paris mosque. Mohammed Moussaoui, head of the French Council for the Muslim Faith, said his organization also deplores "the very mocking tone of the paper toward Islam and its prophet but reaffirms with force its total opposition to all acts and all forms of violence." Dalil Boubakeur, who heads the Great Mosque of Paris, condemned "an act which can in no way represent the principles of liberty, tolerance and peace that are (our) message." But he regretted the "anxious European climate of Islamophobia" fed in part by stigmatizing Muslims through caricatures. The current issue was centered on last week's victory of a once-banned Islamist party in Tunisia's first free elections and last month decision by Libya's new leaders that Sharia, or Islamic legislation, will be the main source of law in post-Gadhafi Libya. "It was a joke where the topic was to imagine a world where Sharia would be applied," Charb told APTN. "But since everyone tells us not to worry about Libya or Tunisia, we wanted to explain what would be a soft version of Sharia, a Sharia applied in a soft manner." A police official said the fire was quickly contained, but a large part of new offices on two levels were heavily damaged and equipment used by journalists to produce the paper were inoperable, a police official said. Piles of scorched papers and equipment were seen at the weekly and its website was down. "If some think they can impose their way of thinking on the Republic ... they are mistaken, they will be fought," said Gueant, the interior minister. Charb vowed to continue publishing the weekly and Paris Mayor Bertrand Delanoe said the city would help the publication find a new office space. Delanoe condemned "this demonstration of hate and intolerance." The daily Liberation offered space. Technicians from the police lab began their investigation several hours after the fire, taking fingerprints and various samples from the site of the paper. Newspaper employees said they had received numerous threats and insults via social networks as a result of this week's publication. The newspaper's website was hacked for several hours and visitors were directed to an Islamist website, the police official said. Page two of the issue is made up of a series of cartoons featuring women in burqas, the face-covering robes. And the paper's tongue-in-cheek editorial, signed "Muhammad," follows on page three, centered on the victory last week of Tunisia's Islamist Ennahda party in the nation's first free election  and saying that the party's real intention is imposing Islam not democracy. Each page contains "a word from Muhammad" in the corner and spoofs the news by twisting it into the weekly's current theme. On the last page, a turbaned and bearded man with a clown-like red nose says: "Yes, Islam is compatible with humor."